Search Engine Optimization is a very popular word for every webmaster. Google is the main source of traffic for almost all websites. So, it is very important to make the website optimized for search engine. More than 75% of internet users click on the first three results from SERP for their solution. There is a funny saying that “you can even hide a dead body on the second page of search engine result page because nobody is going to find it”. We can say that every webmaster should focus on improving their SEO just like they take an effort to improve the quality of contents. In this article, we are discussing SEO for photographers. Just like any other types of content, images can also be optimized for search engines. Just by publishing beautiful images on the internet you cannot be a successful photographer. It should be visible to the audience and you have to ensure that most audiences see your images and interact with you. How can you make this happen? Just like optimizing contents there are some techniques photographers can use to optimize their images so that it can appear on the top of the search engine result. SEO for Photographers – Why it is Important? 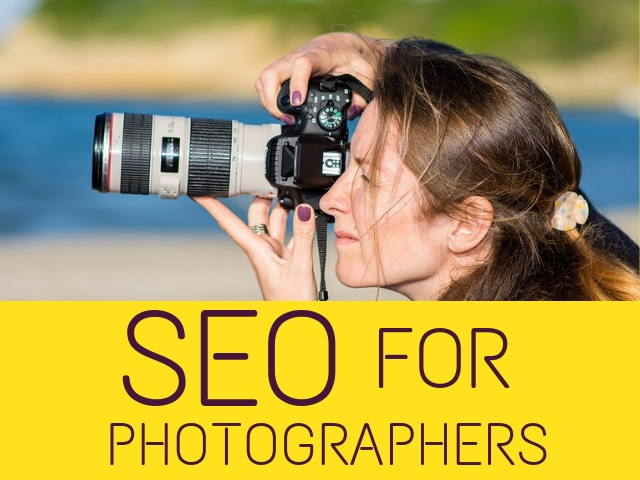 Like any other field’s SEO is very important for photographers also. They are mainly people with creative knowledge. But to succeed online they need to have some technical knowledge. SEO is very useful to implement on their images to make it popular online. There are more than 200 signals that affect SEO ranking and some of them are very useful for photographers. If you don’t have the technical knowledge to implement these SEO factors, it is better to hire some technical experts to do that. While posting photographs it is important to make it visible to the audience. This is mainly possible by including keywords with the image. When a user searches for images with that particular keyword it should get listed on the top position. By doing keyword optimization and other SEO factor implementation, your images can get a greater number of viewers and thereby good ranking from Google. Now that you got an idea about the importance of SEO for photographers. Now we can analyze various steps a photographer should follow to create an SEO-friendly website. After completing all the above steps, you can focus on implementing SEO factors while uploading images. Google can’t understand the images. It considers every website as same and to make Google identify your image add Alt tags with it. When a user searches for images with a specific keyword your image will appear on the search result and they may save it on their social media platform. Pinterest is the main social media website where images inspire people to try. Just like this, when someone shares your image on various platforms it can help you to get new backlinks, new leads and more conversion. Backlinks are links you can get from another website. While trying to build links keep an important point in your mind. Quality of backlink is very important compared to the number of backlinks. Even if you don’t have many numbers of backlinks it is very useful to have a good backlink from a reputable website. Links from a spammy website can affect your website ranking and reputation. Your website can get good backlinks by establishing a good connection with a reputable website. If you are a wedding photographer. you can have a good connection with makeup artists, wedding planners, organizers, caterers, and many other people. If you can give credits to these people while uploading pictures, it can help you to get backlinks from their website too. It can also help to build your website SEO and can have a good ranking position. Another option to have a good connection with other websites is by interacting on social media websites. You can post pictures and actively participate in social media promotions and interactions. There are websites like Quora and Reddit for you to participate in discussion forums. By actively participating in them and providing valuable input in your discussion can be very helpful to be popular in the field. Just by uploading the image a website cannot be successful. You can include some contents with this image to make it more impressive. Don’t write blogs just for the content. You have to create valuable blogs that can be useful for readers. If you are posting a picture, you can write a real-life story or back story about that particular picture in an interesting way. You need to make your website secure. Move your HTTP website to HTTPS. It is a small factor that can affect your website ranking. Long back SSL certificate was only preferred for an e-commerce website. But nowadays Google wants to offer a secure website for all their users and as a part of it, you can change your HTTP website to HTTPS. By getting an SSL certificate, your website can develop good trust among the audience and can also aid with your website ranking. You need to measure your website’s bounce rate using any analytics tool. If a user leaves your website without checking its content once after entering, it is a very bad signal about your content quality. If the bounce rate is higher it means that there is something wrong in your website. It will create a negative impact on your website to Google. Avoid this situation by improving your website content quality. If the bouncing rate is more than 70% it is time to reconsider your website content. If you want to make your website visible locally then you need to work on local SEO. You can implement local keywords while optimizing to get it listed under the local search result. Also, you can register your business on Google My business page to get popular locally. There are other options such as paid advertisements, or Google Ads to take your website on the top positions. Some users will click on these advertisements if the result matches what they are looking for. These can improve the number of traffic to your website thereby its ranking. Social media promotion is very important for every business. As a photographer, you need to focus on social media websites that promote images such as Instagram, Facebook, Pinterest, etc. To be popular on social media, active participation is very important. You can involve in discussions actively and provide better comments. It can help you to be popular among the online community and can also increase the traffic towards your website. Promote your contents through social media platforms and be popular among internet users through your images. While you get the domain name for your website, make sure to get a relevant one with keywords. It can help you to get popular among internet users. It can also help to strengthen your brand awareness and improve its recognition online. If you want to engage your users more then including internal links to relevant articles can be helpful. You might have noticed such internal links in contents. When someone explains about a topic and include a link to other content which can help the users to get a detailed idea about a topic. Sometimes you can also include the most popular post on a website or like a series of contents for the users to read. In order to make your website more popular the building blocks like domain name and hosting service should be strong. It can affect your website’s speed and performance. When you select a web hosting service provider make sure you check the security, they can offer to your website contents. So, a good hosting provider should offer content security, good loading speed, complete customer protection, etc. These are some tips photographers can try to optimize their website for SEO. The domain name should be relevant with suitable keywords also should use a good content management system and hosting provider for better performance of the website. You can also concentrate on mobile optimization, page loading speed, good quality contents, better architecture, etc. To give a better user experience, you can also concentrate on the above factors properly. After implementing these factors, you can use Google analytics or any other similar tool to see how these factors can change your website performance. Are you ready to remodel your website? Start doing it immediately without wasting time.